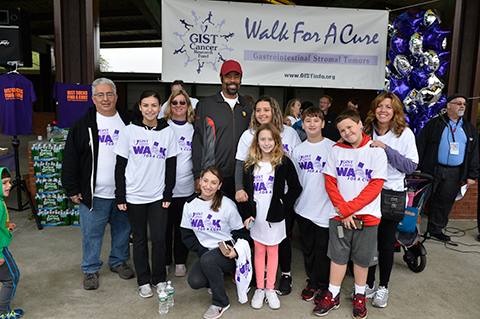 The Walk For A Cure is the GIST Cancer Research Fund’s primary fundraising event. Each year, four Walks are held in Oregon, California, Washington and New York. 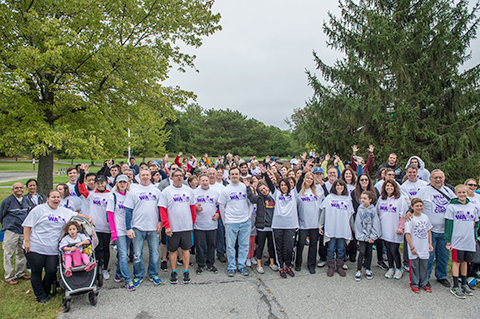 The GIST Walks have become the largest annual gathering of GIST patients, caregivers, researchers, doctors and pharmaceutical company representatives in the world. More than 500 people from across the United States and as far away as Australia have participated in the Walk. 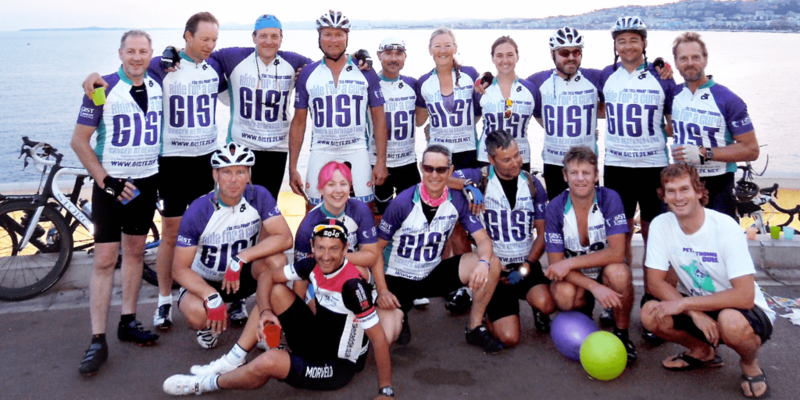 Every three years, the 1,000 Mile, GIST Ride for a Cure is held in memory of Peter Thomas, a British, GIST cancer patient. This 1,000 mile, 10-day bicycle ride was organized in 2006 by Peter who wished to call attention to this little known form of cancer and to raise money for the GIST Cancer Research Fund. Unfortunately, the cancer was too advanced and took Peter's life before he could see his plans come to fruition. In the summer of 2006, in Peter's memory, friends and family completed the ride which went the length of England. In 2009, the team of 20 cyclists, led by Peter’s brother Wayne, wife Riette and son Dylan, rode from Montreal, Q.C. to New York. The GIST Cancer Research Fund’s Cycling Warriors took to the road in 2012 for their 1,000-mile, 10-day crusade along the rugged South Africa coast. It all started in Gordon’s Bay and concluded in Cape Town. For the 4th Annual Ride For A Cure in 2015, cyclists from all over the world participated in the ride from the northern coast of France in Malo to its southern coast in Nice. Plans are currently being made for the 2018 ride. Stay tuned for details! There are many other GIST events such as dinners, silent auctions, dances, fundraising balls, golf tournaments, bake sales, etc. that help to raise needed funds. GCRF keeps all overhead costs to a minimum. All contributions are made directly to the research that will hopefully one day cure GIST and bring life and happiness to so many GIST families and patients seeking it. Help raise money For the GIST Cancer Research Fund. Please let us know about your plans. It is very rewarding and you will be saving the lives of GIST patients and bringing them hope! 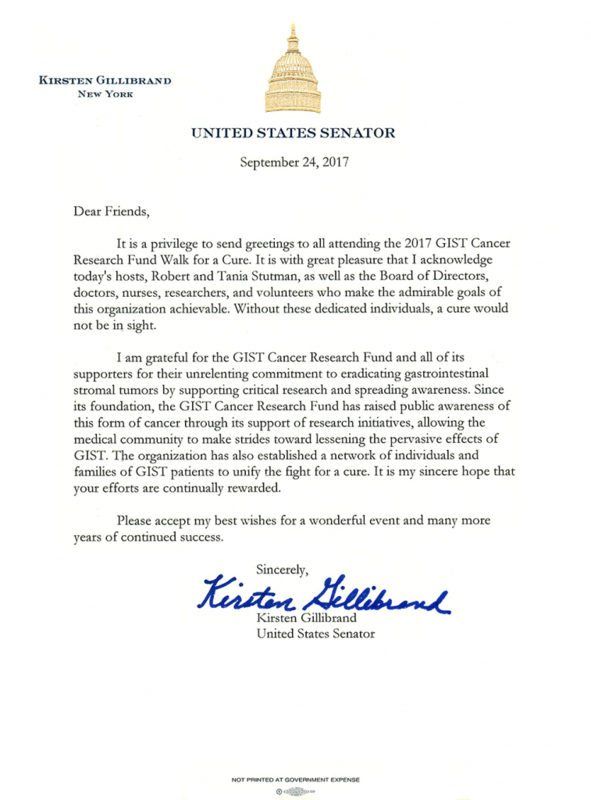 New York’s United States Senators, Charles “Chuck” Schumer and Kirsten E. Gillibrand, graciously acknowledged with proclamations, the importance of the numerous contributions that the GIST Cancer Research Fund and the Walk For A Cure has made to find a cure for GIST Cancer.